Next time you invite guests over for a dinner party, check them for explosives. It’s not like we’re talking Fourth of July firecrackers here. No, one of Senator Leander Rhodes’ guests has brought 5-X, a new type of explosive, in the hopes that the senator will help secure a government contract. Need it be said? Senator go BOOM! On the scene is P.R. man Peter Sargeant. The story begins with Peter on a train. It’s the morning after a romp in a sleeping car with the lovely Ellen Rhodes—yes, the senator’s daughter. They’re on route to Washington, D.C., where Peter has an appointment with the senator, who plans to hire him for an as yet unannounced, but anticipated presidential campaign. Though wisely he doesn’t go into all the details, Peter happens to mention to the senator and the senator’s secretary, Rufus Hollister, that he knows the senator’s daughter and accompanied her to Washington. Their reaction is less than stellar. Apparently, not happy the wayward daughter has turned prodigal. Peter’s invited to stay with the senator and his wife at their Massachusetts Avenue mansion. There, Peter meets the senator’s other guests, the Pomeroys and political socialite Verbana Pruitt, considered “one of the most powerful lady politicos in the country.” Mr. Pomeroy, he of the explosive 5-X, has come from the senator’s home state to secure that government contract the senator promised. Before dinner, Ellen complicates matters by announcing that Peter’s is her fiancé. Or at least her fiancé du jour. Everyone seems to take that in stride, and later, after dinner, we hear more about Pomeroy’s new developments in gunpowder. The guests begin to retire around midnight, but the senator, as his accustomed habit, settles into his second floor study for some late night work. And then the BOOM! Someone put a couple sticks of 5-x in the study’s fireplace, knowing full well the senator would light the midnight oil. Was it Pomperoy fearing his contract would be rejected? Was it Pomeroy’s wife, who turns out to have a surprising connection to the senator? Perhaps it was the seemingly retiring wife who is said to be behind the senator’s ambitions and may have felt slighted. Could it be the daughter for feeling rejected by her father? Or how about Verbana Pruitt who admits she’s not “pro-Rhodes” and might possibly want the senator’s presidential campaign ended before it’s begun. And let’s not forget the senator’s secretary, Mr. Hollister, who seems intent on finding some papers that were in the senator’s study. In the introduction to the Vintage Crime Black Lizard reissue of the Peter Sargeant novels, Vidal explains that in the 1950s, “Victor Weybright, then an editor at E. P. Dutton, suggested that Gore Vidal try writing a mystery novel under a pseudonym. 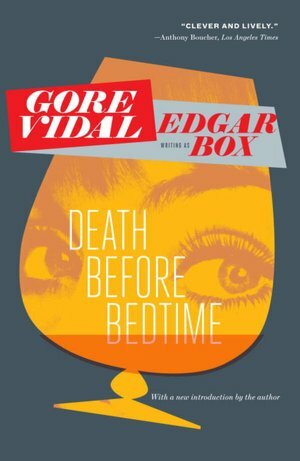 Inspired by writers like Agatha Christie, whose work he knew well, Vidal took the suggestion and began writing mysteries under the name ‘Edgar Box’.” In all, Vidal wrote three mysteries featuring public relations man Peter Sargeant: Death in the Fifth Position (1952), Death Before Bedtime (1953), and Death Likes It Hot (1954). Though I’ve only read the second novel to date, I do have to wonder why there were only three. The novel was quite fun and entertaining. The characters are livley, and the mode of murder is an unusual one. Death Before Bedtime, and likely its companion volumes, would make for a good Mad Men-esque film series.